This relatively modest pattern was uncovered during the renovation of a home in Georgetown, Delaware. 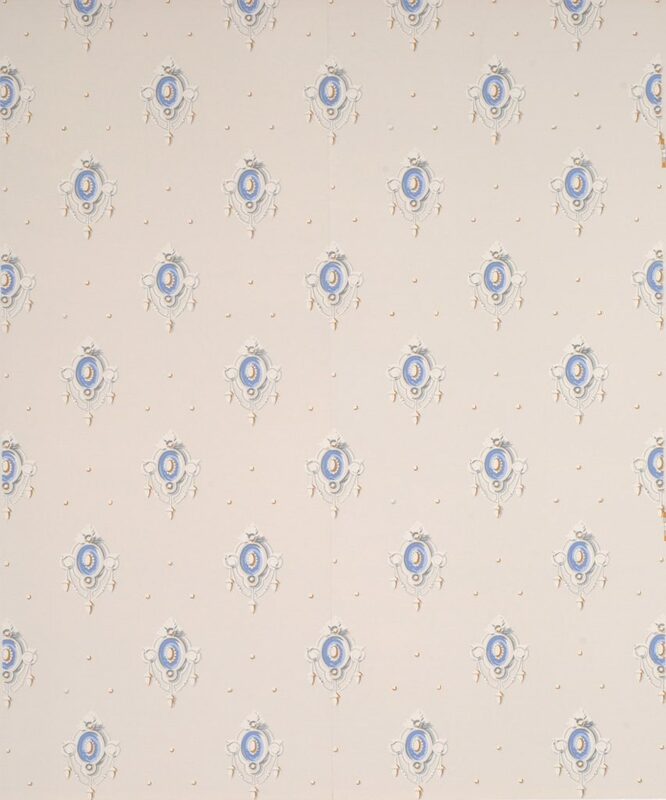 Originally machine printed, it contains elements of both an earlier aesthetic and hints of the direction in which wallpaper design was to develop. The use of highly defined imitation plaster or stucco motifs echoes neoclassical devices of the early 1800s, while the wide placement of the individual medallions reflects growing desire to move away from more voluminous papers of the mid-century. Adelphi occasionally reproduces patterns from this post-1860s period if the design and color characteristics lend themselves well to block printing. Imperial Measurements: Repeat 11 inches, width 19 inches, length 11 yards, straight match. Metric Measurements: 27.9 cm, 48.3 cm, 10 m.